I had to upgrade from Windows 7 as the Home Premium Edition only supported 16GB of RAM, which was irritating. I knew Windows 10 was coming but it’s End of July release date hadn’t been announced. So when it popped up offering me my “free upgrade” I accepted and am now dutifully waiting a couple of weeks. But what about VMware workstation? Like quite a few home-labbers I am sure they also got their license by passing their VCP. It’s no mean feat and after investing time, effort and £2000+ on an ICM course it’s very nice to get a copy of VMware Workstation when you pass. After my VCP4 I didn’t get around to using Workstation 9 much at all. But after VCP 5 I have been using Workstation 10 quite a bit to build out a lab for VCAP-DCA and subsequently NSX/VCP-NV revision. So….will Workstation 10 run on Windows 10? to his communities post pointing out that bug fixes to Workstation 11 had been made to smooth operation with WS11 running on Windows 10. Those same fixes didn’t appear in recent updates to Workstation 10. That’s fine. I understand things move with the times but now Windows 10 “Free Upgrade” was looking like it will cost me £105 to upgrade to Workstation 11. So I thought I’d try something crazy. On my Windows 8.1 PC I created a VM inside Workstation 10. On that VM I installed Windows 10. I then created a Debian 64bit VM with 2GB memory and it ran fine. So, whilst it likely to be wholly unsupported and any problems that occur would come with the fix “Upgrade to Workstation 11”. 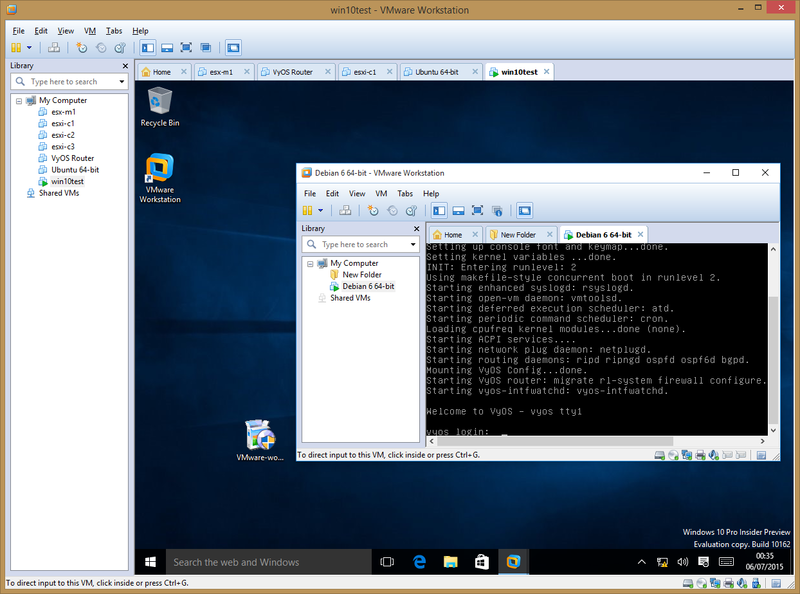 It is possible to run VMware Workstation 10 on Windows 10…..! In a recent change of tack to my learning plan I’ve moved from revising VCAP-DCA to VCP-NV. This has been driven by a need for work to be familiar with NSX and Multi-Hypervisor Virtualised Networking too. I did a couple of the NSX Hands On Labs last October at VMworld but other than a few terms, and the fact some bits looked a lot like vShield from the vCloud Suite most of it had leaked out of my brain. I started first revising the basics and thought that the VCA-NV Fundamentals free online CBT from VMware would be a good place to start. It was but if I’m honest the woman’s voice reading it out was a bit monotonous and she was obviously reading from a script as a professional reader rather than a techy. She often got bits wrong or pronounced them awkwardly. But sometimes techies can be awful presenters and speakers too. Anyway I ploughed through the 3 hours-ish skipping some of the very basic concepts of vSphere Networking I’m already fully up to speed with having used them for a long while now. It’s a good primer even for well heeled vSphere admins as it covers some of the Networking areas such as L2/L3 routing which may not be second nature if your background isn’t networks. I then asked a colleague what he’d used as I heard he had just passed his VCP-NV in a rush. He mentioned Pluralsight. This reminded me that I already had a free subscription to Pluralsight which they gave out last year for vExperts. I didn’t apply for vExpert status to get it, but any freebie is nice. I had used it ever so briefly in the run up to my VCAP-DCA510 but didn’t have the time to really use the site to it’s fullest. So with the disclaimer that “I got this free” out of the way what was it like? I liked the website. It’s clean, gets straight to the point with a search box to find what you want (who uses menus/hierarchies anymore?). Importantly it works on Chrome/IE for Windows, it even runs in Chrome for Android so it’s not hooked on Flash which was refreshing and made it feel ever so slightly modern! The HTML5, I presume, player easily expands to full screen, has simple transport controls and my favourite bit of all is the speed control which I will give it’s own section! There’s a great Android app which replicates the same simple interface that gets you watching course material quickly after log in. The transport controls are replicated along with a nice, pop-in from the side, index/contents menu. That brilliant speed control was there again even more easily accessible in the app. I didn’t try offline via the website if there is the option, but using the app there is an option to store 30 modules (that’s sections within a course not 30 courses and the module count varies per course). So I saved the two NSX courses for offline viewing at lunchtimes at work on my tablet. It synchronised them quickly and used up 11 out of my 30 offline module slots. If you do keep online then it will synch or at least remember the furthest point you got through a course. Having my tablet with me at work meant I could lunch and learn without being online. Part of the reason I hadn’t thought to check Pluralsight before my colleague told me he’d used it was last time I checked…there wasn’t any NSX material on the site. Searching now threw up two courses by the inimitable Jason Nash. He is currently CTO at Varrow. I won’t rewrite his bio here but he has been in the industry for a while and is a VCDX (and CCNP which is relevant for this course). The first course was a great starter from VMware’s aquisition of Nicira right into installation of NSX Manager, NSX Controllers and how it integrates with vCenter Server. Including all the necessary bits in between providing good revision for anyone rusty on their dvSwitches. The background bits were relevant without wandering off into personal anecdotes. I’ve only done a couple of modules of the second course but this is a deeper dive into the constituent part of NSX and follows a similar format to the first. Edit: A colleague who works with SDDC/SDN asked what the detail level of NSX-MH is in these courses. The simple answer is very little. Jason explains the history of and what the NSX- MH version is and why you would use it instead of the vSphere version but these courses are aimed at “NSX for vSphere”. As promised this section is simply repeating again the virtues of the speed control. I’m trying to cram as much information in as possible and I’m used to learning fast. That’s for a number of reasons, not least because with young kids I have to get information in before I fall asleep if I’m revising at night! Jason speaks nicely and clearly but he is quite a relaxed American (I’m from Manchester, UK and speak quite quickly) so it’s very very easy to notch him up to 1.25x speed and barely notice it has been tweaked. For some of it though I was able to soak in details even with the speed cranked up to 1.5x This meant a 3 hour course only took 2 hours to listen to and absorb. This is one of the biggest advantages of this system and may not seem revolutionary to those who found the feature on YouTube videos ages ago. However couple it with the great content presented by a knowledgeable techie rather than a hired voice and I can honestly say that I’d happily fork out the $29/month fee to get access to the courses and mobile apps, however I have noted that for offline viewing it jumps to $49/month. A couple of months or even just one to cram for an exam, as I’m doing I think could justify that and then cancel perhaps or drop back down to $29. Maybe lean on your employer to pay it! Twitter is on fire with frantic retweeting and updates on what people are excited about on the VMware front. And there’s plenty to be excited about right now. The biggest unsurprising but best bit is vSphere 6.0 goes GA. Now everyone can try long distance vmotion, VVols, 4vcpu Fault Tolerance, Instant Clone and more. 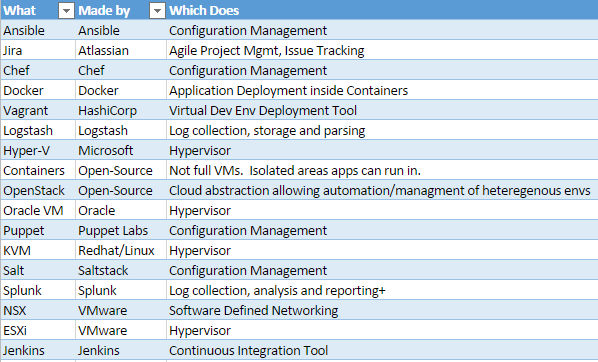 To help you along with that comes the vCenter 6.0 Deployment Guide. Fun bedtime reading for vExperts and kids alike. Not enough for you to play with? Or you did all that 6.0 stuff in the Public Beta? Finally a pre-Easter treat from VMware Certification. 1/2 Price VCP-NV until June 30th. So if you’re wanting to get all Software-Defined in your network then get learning and register/book your VCP now on the cheap! And that is your lot. If it’s not enough then you are insatiable and it’s not my job to sate you! I upgraded my pc to a beefy spec just before Christmas. i7 4770s giving me 8 threads to throw at VMWorkstation and 16Gb of memory, along with my existing SSD. A quick reinstall of windows and install of VMWorkstation and I had a great lab to revise for VCAP-DCA510 in a hurry. However I had promised myself that I’d set aside £120 this month to max out my motherboard with another 16Gb. There’s another good reason to go that limit. I didn’t pass 510 and the 550 exam has a different setup including more hosts and VMs/SSO boxes etc. So I bought the 16Gb and it sat ready to be installed whilst home life happened and stopped me opening up my case. I did that tonight. Duly inserted the new memory and booted up. No errors (time to put the side cover back on now! )….But WAIT….Windows is only showing 16Gb of memory. However CPU-z dutifully informed me there were 4 banks occcupied and 32gb there. DOH!!!! I suddenly realised, but had never really considered. That I was running Win7 Home Premium. It had sufficed for the last 5 years and like most others I had been in no rush to jump to Windows 8. A quick visit to MS confirmed my suspicions. I’ll confess to doing a quick google to see if there was something as cheeky as a reg hack around this “oversight” it quickly became apparent there wasn’t (Kernel hacking isn’t something I really fancy). So what were my options. Well the obvious one is Windows 7 Pro. That is £129 now. Not a fortune but a lot when you consider I bought all the hardware recently. A surprising option was upgrade to Windows 8.1 (Standard/Core/Basic) as when MS released 8 they also increased the memory Limit to 128gb! The final option is a very precarious one. Windows 10 Tech Preview. What!? I hear you cry. Well as you will all have read this is coming free to Windows 7&8 users soonish anyway (some sites say June, others say months after) so I may be jumping the gun a little bit but it would give me 32Gb in windows…..However…….My licensed version of VMworkstation is 10 which MAY but most likely not run on Windows 10. So I would need an upgrade to Workstation11. I may test W10 TP on my HP Micrososerver and test if vmworkstation 10 runs on that…but it is frustrating that just to get around a single byte of code in the Win 7 Kernel which says 0x10 not 0x20 is going to set me back another £99 and an OS I’m not itching to jump to…..but ho hum such is progress! Last Thursday I got the early train to Leeds stationed myself in a coffee shop and proceeded to stuff coffee and pastries into my mouth and last minute vSphere knowledge into my brain. I had obtained a voucher to book the exam last year. However I’d been seconded to a “Business Transformation” project. Whilst this was quite interesting it did cause my technical skills to atrophy. To cut a long story short I rescheduled the exam a couple of times. However when a friend retweeted just before Christmas that 510 was going to be retired that was the end of that. I had 3-4 weeks to revise/read/cram and lab. Unfortunately Christmas isn’t the season conducive to revision. In real terms I studied every evening for 2 weeks. I spent a lot of time reading, with occasional visits to my lab PC. That was sufficient time to absorb and understand all the topics on the blueprint. There wasn’t anything on the actual exam that surprised, shocked or surprised me. I’d read about it or practiced it all at least once. Why didn’t I pass then? Well that’s simple. Not enough lab time. It sounds obvious but it really really can’t be overstated. There were 26 tasks on the exam and 3.5hrs to do them in. That’s less than 7 minutes per task. Don’t forget it takes a few minutes to familiarise yourself with the exam environment and hostnames/ips. So think 6 minutes per task. I would put it slightly differently, and this is where the blueprint comes in. Think of the Blueprint (and definitely Chris Wahl’s Study Sheet/Checklist) as a list of things you will need to do for the customer. It’s their requirements doc. It’s not specific. The IPs or hosts or networks or VMs details will be given to you in the task “on the day”. But they have an outage window of 3.5 hrs with a hard stop. You need to have done what they need in that time as users will be let back on the environment afterwards. Given that premise then you need to be able to do each and every one of the Blueprint/Checklist tasks in 5 minutes. Not think you can. Not do it once. I mean you need to drill yourself on it. If the task is (and I’ll quote blueprint/checklist items here) change a pathing policy then all you should need it the LUN/Path/Disk detail and which policy. Bosh. If the task is migrate all of a host’s, or specific standard, switches to a DVSwitch then 5 minutes later. Bosh. Set up FT? 5 minutes Bosh! The many VCAP study blogs out there are great. Finally a massive shout out to Josh Andrews. His test-track lab which he generously allows remote access to is a great resource that I can’t recommend enough. It really gives you a feel for the exam and if you’re ready to do the kinds of tasks that you might encounter. Drill in the lab 100s of times until I can perform each task in the time it takes an egg to boil. I’m currently in the midst of revising/labbing for my VCAP5-DCA. So I have my nested esxi lab environment running in workstation 10. All was going well until I tried to test out some VMware Update Manager tasks. I had installed VUM on a 2k3 VM running on one of my esxi hosts (I may break it out to run in workstation when I have more memory). I could scan/remediate the host the VM was on, but I couldn’t scan the other host. I tried vmotioning the VM. It failed…due to a networking issue. I cold vmotioned the powered off VM and started it on the 2nd host and VUM could scan it…but not the original host. A quick run through was that the hosts could ping the default gateway (the VMWorkstation switch) they could even both see my Synology NAS and mount/map NFS/iSCSI LUNs. But they couldn’t ping each other. They could ping everything else and everything else could ping them. They had just plain fallen out with each other! I ran over the network config in workstation and there is very little to customise on a per-vm setting. Plus they were just NAT’d exactly the same as the other VMs. VMworkstation Virtual Network ruled out. So it was something specific to both hosts. Now foolishly I’ve been doing lots of lab exercises and not got my esxi hosts set to have non-persistent disks. So somewhere in the last week or so I have changed the networking and not recorded/documented the random PowerCLI/esxcli/vma command which has stopped them talking. Then I had an epiphany. I don’t need to know what’s different. I’ll just use vSphere/vCenter to set them the same! And voila. Ping was working! If you’re using a lab environment set your disks non persistent. If you’re in Production….don’t make a change without documenting it and creating a new host profile with similar level of detail/description to explain what changes have been made.